How To Cat Feeding Schedule And Why Does It Matter? Is your cat is overweight? Or, maybe your cat is on a special diet. How do you monitor your cat’s food intake? It can be difficult to stick to a cat feeding schedule and monitor what cats eat because — unlike most dogs who gobble down food in seconds flat — cats tend to graze. They nibble and wander and return to nibble again and again throughout the day. Enter meal feeding, a scheduled way to feed your cats twice a day, taking the food away if your cat does not eat it at mealtime. Here’s how to do it and why it’s beneficial. The benefits of meal feeding for cats far outweigh the slight inconvenience or extra time it takes to divvy out separate meals twice a day. Meal feeding cats helps to monitor portion control. Portion control is a biggie! Cats get overweight easily. I use a simple plastic measuring cup to dole out each cat’s portion based on his age and weight. If you have multiple cats, feed them in separate areas or rooms to ensure that no one is mooching off another cat’s portion. If your cat is used to having food available all day long, he may whine and cry for more in the beginning. Keep in mind that you are working toward a healthy feeding schedule. Check with your vet to see if you can offer your cat healthy treats in between meals. Remember, it’s OK if your cat doesn’t eat every last morsel in the allotted time. (With the exception of cats who take their medication mixed into their food. See below for tips on doling out medications). They’ll be back for dinner and for breakfast tomorrow and so on. Meal feeding cats lets you observe your kitty’s eating habits. It’s important to regularly observe your cat’s eating habits. This is especially true if your cat is on a special diet or takes medicine in his food. You’ll be able to see if your kitty is getting the proper nutrition and medicine dosage he needs to be healthy. Observing the eating habits of multiple cats is much easier with meal feeding. With each cat being fed in a separate area or room, you will notice subtle changes in eating habits much more quickly. Meal feeding cats makes it easier to dole out medications. If your cat takes medication on a daily basis, mealtimes are the perfect way to mix in a little medicine on the sly. However, some pills and medications can be quite smelly, and most scent-savvy felines will turn up their noses at the faintest whiff. You might need to get more creative. Your veterinarian may be able to offer you the same medication in a different form, such as a flavored liquid. Your vet might also recommend an alternative medium to mix medication into such as tuna fish, baby food or a soft, malleable feline-specific treat. Meal feeding cats makes eating meaningful. Sharing mealtimes with your cats is a great way to strengthen bonds. Make mealtime special by sitting nearby. As your cat adapts to meal feeding, he will no doubt nibble and wander slightly. Use this time to pet him and catch up on the latest gossip while gently redirecting him toward the food. Sharing mealtimes is easy if you only have two cats — you can “eat with” one during breakfast and the other at dinner. 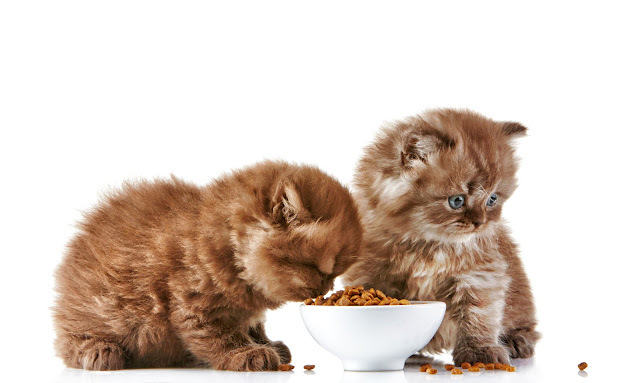 For multiple cats, divide up your mealtime visits throughout the week. Why not go all out? Add a little festivity to your feline’s meal time with colorful, seasonal or cat-themed placemats. They also help make clean-up a little easier. Use meal feeding as a helpful reminder to freshen water. My cats are mischievous. They like water. They play in their water bowls. So, our meal feedings are a timely reminder for me to freshen up their water supply because, as far as I know, spring water should not contain actual tiny, colorful springs. Nor should it contain litter residue from busy feline feet.